In an event organized in San Francisco Apple announces its much awaited iPad that is a third generation device for the geek lovers. With an attractive looking screen the price for new iPad varies from $499 for a 16GB Wi-Fi model, with 4G starting at $629. This is Apple’s third generation tablet. In this iPad the screen resolution has been increased to 2,048x1,536 pixels. In design, it is much similar to 2011’s iPad 2. The tablet's glass and aluminum built is 9.5 inches tall and 7.31 inches wide. Thickness is 0.37 inch and it weighs at 1.5 pounds. It home button on the bottom of the screen, and a volume rocker on its right side along with the mute switch/rotation lock. There on the top exists a sleep/wake button and headphone output, and the bottom edge that retains the 30-pin port. The camera quality in the iPAD has been improved to the considerable level of 5 megapixels with 1080p video recording and backside illumination. The front side camera is as similar to as in iPAD 2. 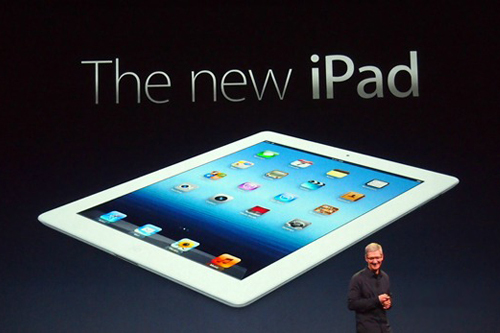 With introduction of iPhone 4 and retaining Retina Display in it has been repeated in new iPad’s 9.7 inch screen. The Maps app on the iPad presents a sense of omnipotence that is very hard for a mobile device to learn and recognize. In this handheld device one can enjoy all including games, movies, photos, and magazines. The iPad's processor has been upgraded to an A5X. While the CPU remains dual-core, the graphics processor has been improved to the level of quad-core. This has helped in improving the pixels four times from the previous model. Another important attribute of the phone is voice dictation on a tablet. Voice dictation is a welcome addition, and would help in great way in writing e-mail and bypassing the touch-screen keyboard for getting the helpful and reasonable information. Bluetooth 4.0 is another feature which has been adopted from the iPhone 4S and extensive improvements have been made into battery life and efficiency.